According to the Centers for Disease Control and Prevention, an older adult falls every second of every day in the U.S.
An older adult falls every second of every day in the U.S.
That’s a lot of falls—some with serious consequences. Aging causes bones to become brittle, and broken bones don’t heal as easily. 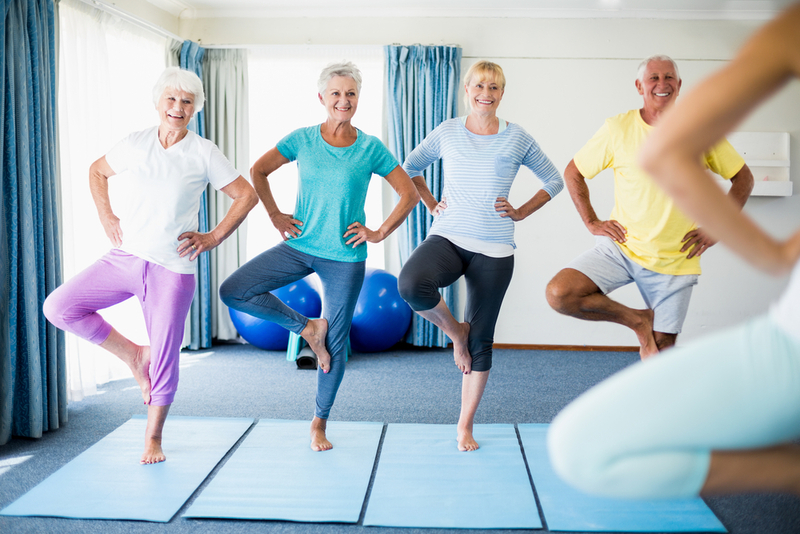 We tend to lose balance with age for a number of reasons: could be due to a medical condition, side effects of dizziness or vertigo due to medications, impaired eyesight, or an overall decline in physical fitness. The good news? Medical conditions aside, balance is a motor skill that can be maintained and even improved. It’s not going to happen, though, without a little effort. First and foremost, you have to get back on your feet. Don’t let poor balance result in a cycle of inactivity and muscle loss. Gain confidence—and muscle—through regularly doing simple balance and strengthening exercises. Even better, you can do the following exercises anytime, anywhere. Start with an easy exercise. Stand on one leg, gripping a sturdy chair (no wheels) for balance—use both hands. Lift your right foot about an inch off the floor and balance on your left foot. Hold the move for 10 seconds, repeat 10 times, then alternate legs. The goal of this exercise is to get strong enough to eventually hold the pose—without using the chair for balance—for up to a minute. By walking heel to toe, you’re strengthening your core and your leg muscles while simultaneously improving your posture. To do this one, mark a straight line with masking tape, then walk heel to toe, with your heels and toes almost touching. Focus on one spot directly in front of you. Stretch your arms wide as you walk (picture a tightrope walker). Repeat 20 times. Improve physical coordination by standing next to a chair, feet together and arms at your sides. Lift your left hand over your head and slowly raise your left foot off the floor. Hold for 10 second and repeat with the other side. Using a chair for support, lift one leg at a time as far back as possible. Bend the leg you’re standing on, raise your other leg. Hold the position for a few seconds. Repeat 10-15 times. Bonus: this exercise helps to strengthen your lower back. The side leg exercise will help strengthen the upper legs and hips. Hold onto a chair, keep your back straight, toes facing forward, and hold the position. Repeat 10-15 times. Breathe slow and steady. This one is as easy as it sounds—standing straight, lift your right knee high, lower, then lift the left leg, or march in place. Marching is as fun as you remember. Repeat 20 times. Sit in a chair and lift both arms above your head. Use a light weight (or a can of vegetables works, too) and rotate your arms like you’re making a large circle in the air. Sitting in a chair, hold a ball at arms-length, keep it up to shoulder height. Twist slowly to the left, then to the right. Repeat. Strengthen your arms by bending your elbows, then bring your hands together, and push with both hands (right hand pushing into left and vice versa). Have an open dialogue with your general practitioner—tell him or her if you have fallen recently, worry about falling, or feel unsteady. Mention all of it. Don’t be too embarrassed to mention a recent fall. Some medications can make you feel dizzy or drowsy, leading to falls. Let your doctor know about every medication you take—even over-the-counter ones that might not seem worth mentioning. Schedule an annual eye exam. Limited vision can impair your mobility. Eat foods high in Vitamin D and rich in calcium. Get out of bed slowly. Sit on the edge of the bed, take a few deep breaths, and get your bearings before attempting to walk. Try tai chi or yoga. These gentle activities can significantly improve your balance and flexibility. Getting some exercise every day—even a moderate amount—is really the best way to stay steady on your feet and reduce the risk of falling. If you haven’t been active recently, consult your doctor before doing these exercises. © Copyright - American Baptist Homes of the Midwest - All Rights Reserved.